How stress affects your health and helpful techniques to stay slim, fit and feeling good. Stress is a reality of everyday life. While nerve-racking situations are difficult to avoid, our chances of remaining healthy and feeling good greatly depend on how we manage, cope with and recover from stress. In order to combat the effects of stress, we must understand the role it plays in our physical health. Clients come into a Pilates studio seeking the numerous physical benefits that are associated with the method. What they might not realize at first is that the physical benefits of a consistent and meaningful Pilates practice can go well beyond external body aesthetics. I have learned, through studying with and teaching for BASI Pilates, that stress reduction is a profound benefit of a regular Pilates practice. 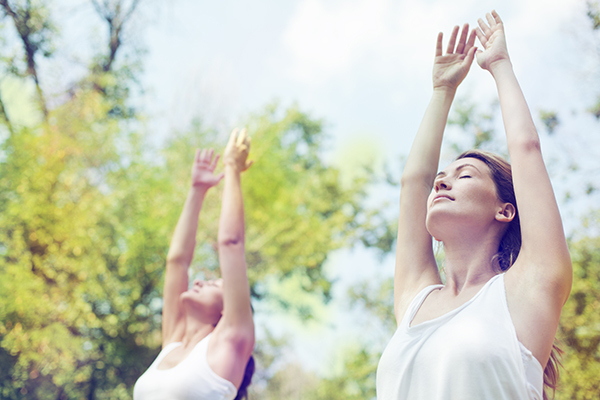 Pilates helps to ease the effects of stress through the implementation of its central principles: breathing techniques, body awareness, relaxation, concentration, mindfulness, balance and harmony. Many professionals in the health industry—both medical and fitness—work with patients and clients that often express frustration with symptoms such as fatigue, weight gain, muscle loss, weakness and depression. A high-stress lifestyle and an inability to self-manage stress is a major contributing factor to these symptoms. We must ask ourselves the following questions: How much stress and what types of stress do we have in our lives? How do we handle and recover from these stresses? Exploring and discovering the answers to these questions can significantly change how we remedy these physical symptoms. When we feel stressed, our bodies release cortisol (via our adrenal glands). When secreted in normal amounts, cortisol gives us baseline energy throughout the cycle of a day. Cortisol is also reserved to help us meet the challenges of acute stressors. When we feel threatened, the adrenal glands release cortisol, setting the body into a “fight or flight” mode. Cortisol secretion appropriately alters metabolic function through the release of stored sugar into the blood stream for quick energy. Cortisol also acts in suppressing immunity functions and increasing heart rate and blood pressure. The destruction of healthy muscle and bone, which contributes to weakness and fatigue. The impairment of chemicals that are needed to make other hormones (i.e. serotonin). Medical professionals prescribe lifestyle changes that promote stress reduction to those patients suffering from chronic stress and elevated cortisol levels. One specific prescription is the integration of a regular, moderate exercise program. Other stress management techniques include breathing exercises, imagery, meditation and self-awareness. Pilates is a form of exercise that improves the functional strength and flexibility of muscles and bones, has the ability to slim your waistline and helps to correct posture. As previously mentioned, a meaningful and consistent Pilates practice opens the possibility for a permanent lifestyle transformation. Next time you feel stressed, try implementing and focusing on the following stress management techniques into your Pilates practice. Pilates is certainly not the sole remedy, nor a cure all, for a lifestyle consumed with chronic stress. It is, however, one of many positive agents that assist in making permanent lifestyle changes that include physical activity, relaxation and meditation. Most importantly, the true nature of Pilates is one of dynamic balance and harmony, making Pilates a positive way to reduce stress—and opening the gateway for successful efforts in staying slim, fit and feeling good.